many options for enjoying what the Arsenal has to offer. During World War II the Rocky Mountain Arsenal was converted from farmland to a chemical weapons manufacturing plant. 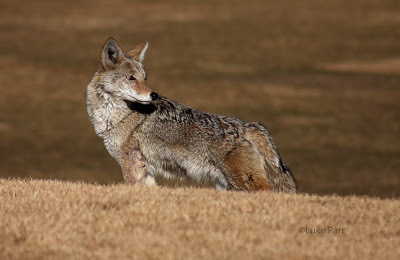 Even during the production of military weapons, the staff noted that large parts of the unused complex were home to local deer, coyotes and a huge variety of birds. As the cold war came to an end the land was the focus of massive environmental clean up efforts. As the clean up continued, the focus shifted from manufacturing weapons, to creating a habitat for wildlife. 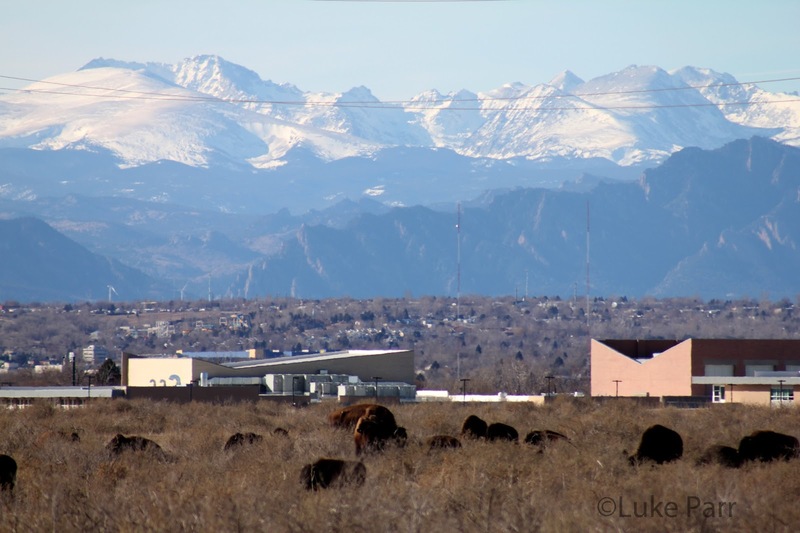 Today the Rocky Mountain Arsenal is the home to a herd of buffalo, as well as Mule Deer, coyotes, the Bald Eagle, Northern Pike and more. I recently took my kids to the Arsenal for some easy hiking while parts of the front range were covered in snow. My son loves to see bison and it was the highlight of his trip to Yellowstone National Park a few years ago. 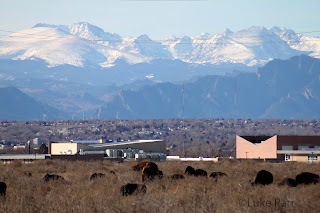 The buffalo herd was one of the main reasons we chose to visit the Arsenal. Unfortunately there aren't many places anymore that give you the chance to see herds of buffalo in what is a mostly wild setting. We weren't disappointed and saw buffalo as soon as we entered. As we drove through the Arsenal we had buffalo crossing the street as cars pulled off to the sides to watch them pass. It is a scene that you would expect to see more in one of the more famous national parks, namely Yellowstone. Buffalo graze along the Colorado front range. As the photo to the right shows, we were able to see the buffalo grazing below the Colorado front range. 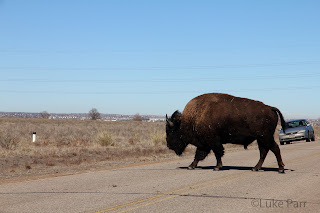 Although the buildings and power lines detract somewhat from the overall experience of seeing the buffalo, it was still impressive to see the buffalo roaming in an area that they have all but been wiped out of. 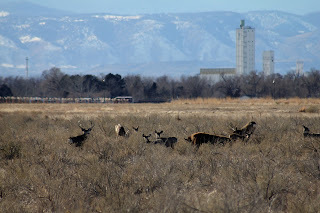 Mule Deer at the Rocky Mountain Arsenal. Near the herd of buffalo we observed a small herd of Mule Deer. There were several nice sized bucks among the group. They didn't seem to have any qualms about grazing around the buffalo. We saw a few more deer throughout the Arsenal and while on our hike around Lake Ladora, but this seemed to be the largest concentration and the best bucks in the area. Much of Lake Ladora and Lake Mary were still frozen during our trip on the trail around the larger lake. While you can fish it during the summer, it was closed to fishing during our trip. I have heard that the the lakes are well known for producing some of the best Northern Pike that you can catch along the front range. I hope to come back later in the summer to try it out for myself. If you decide to go to the Rocky Mountain Arsenal to fish it, make sure you check out the current fishing regulations here. Northern Pike at the Rocky Mountain Arsenal. As we finished up our hike around the lake we noticed a patch of bare water near a building situated along the lake. I decided to take the kids to the opening, just in case we could catch a glimpse of one of the Northern Pike cruising the exposed water to warm up in the snow. 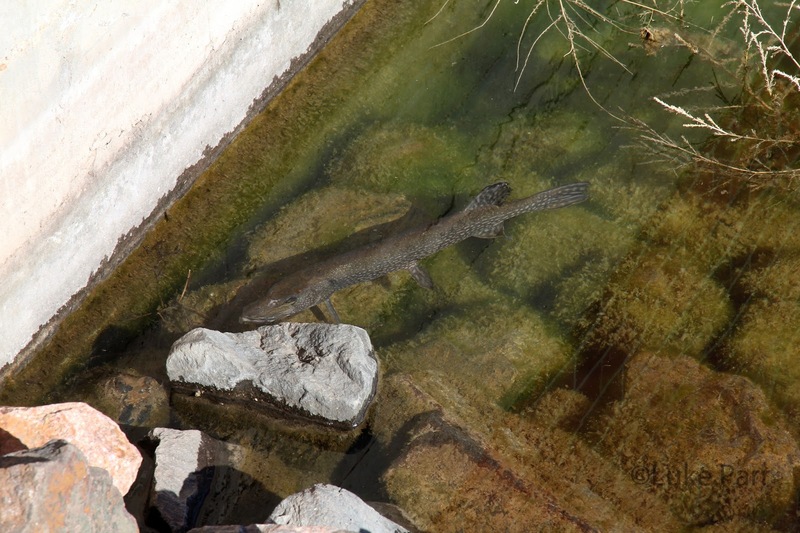 Surprisingly there was a nice sized Pike relaxing in the shallows right at the edge of the building and the shore. Seeing the Pike got the kids excited about trying to fish the lake come spring time! 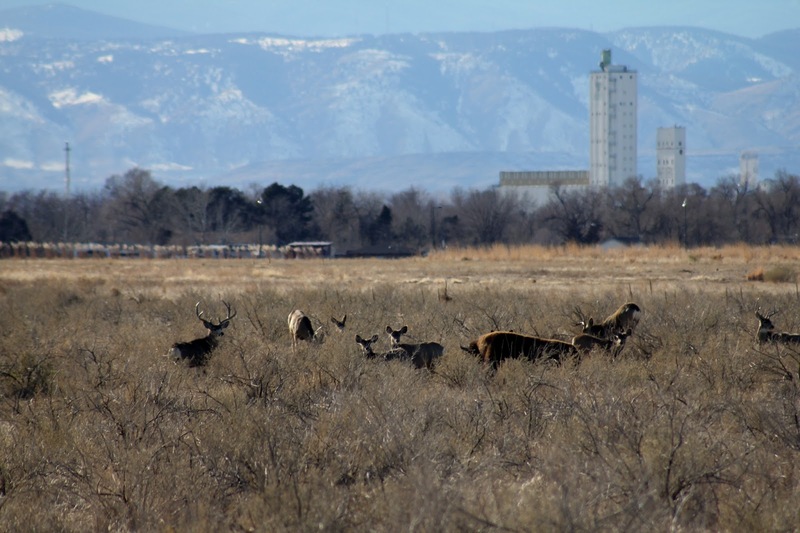 What are your thoughts of the Rocky Mountain Arsenal? Have you caught any great Pike, or taken an amazing Bald Eagle photo? Let me know your favorite part about the Arsenal in the comment section below.